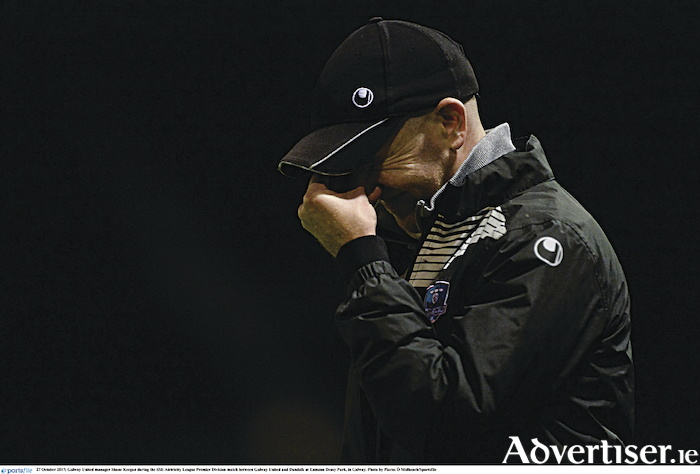 Departing Galway United manager Shane Keegan gave it his all, but failed to get the necessary results. Representatives of the planned Saudi investors in Galway United are expected in the city this week. It comes after a special general meeting on Monday when members of the Galway United Friends Co-operative, which owns the club, voted to accept an offer from two Saudi businessmen to take a majority shareholding in the club. The investors behind the company name, SportLink for Sport Marketing, are believed to be Abdulrahman Al Nemer and Mohammed Al Ruwaite. They are set to acquire a majority holding of 75 per cent of the club, with the remaining 25 per cent owned by the Galway United Friends Co-operative Society. The new investors will be represented on a new board. Despite some misgivings due to the lack of clarity surrounding the two investors, 86 per cent of the co-op members present voted to accept the deal. It came after a detailed presentation, a question and answer session, and discussion on the merits of the proposal, with many supporters feeling there was no other viable alternative to maintain a League of Ireland club in Galway. While it remains unclear how many people will sit on the board, the Saudi investors say they are committed to put substantial funds into the academy and youth development. Currently Galway United field at U15, 17, 19, and senior level, while from next year an U13 team will also be competing in national competition. It is understood an initial investment of €500,000 will be made in a bid to boost United's chances of promotion, with some new players being signed during the coming transfer window, in addition to the appointment of a new team manager, following the departure of Shane Keegan. But there has been no mention of any increased investment which would help United develop a stadium of its own, find Eamonn Deacy Park owned by the Galway FA. Keegan agreed to step down "by mutual consent" according to a statement issued by United. "We would like to thank Shane for his contribution during his time at the club and wish him every success in the future. "The club will look to appoint a new manager as soon as possible and will be making no further comment at this time." The costs of running these teams is quite high and representatives for the investors are due in Galway in the coming days to establish the final terms and conditions of the deal. However Keegan, who arrived via Wexford Youths after five years, has apologised to supporters via a message, for his failure to date. "No excuses. Results were not good enough, but I can promise ya that it wasn't for the lack of effort," he wrote. "Embrace the potential new investment, but don't lose the core elements which make the club unique." Keegan was in charge for the 2017 SSE Airtricity League premier division season which ended in relegation despite a brave fight following a wretched opening to the campaign. Inevitably United's most prominent performers departed and this year has proven to be a struggle on and off the field. Friday's scoreless draw against lowly Wexford FC was the latest setback for United, who have not registered a win since defeating Cabinteely on May 20 at Stradbrook. In the intervening five games United have suffered three defeats against Drogheda United, Longford Town, and Finn Harps, while stalemates with Cobh Ramblers and Wexford were also viewed as disappointing outcomes. The poor run of form means United have slipped to sixth position in the table. Several important decisions will be made shortly with the June 29 Eamonn Deacy Park encounter against Shelbourne a critical fixture if United hope to remain in contention for promotion. Discussions between the United board and the investors from Saudi Arabia will continue to establish the final terms and conditions of the deal. United's main sponsor is the property development company, Comer Group Ireland, led by Glenamaddy brothers Luke and Brian, but there has been no mention of any increased investment from either the Saudi pair or the Comer Group on a possible move from Eamonn Deacy Park, owned by the Galway FA, to a new purpose-built stadium.